Ever stumbled into a new city, a place brimming with possibilities and with a reputation to match, and found yourself completely overwhelmed, fumbling around for somewhere to eat, realising that all the good places are closed/rammed/somewhere else, and being forced to settle for some lazy tourist trap with barely a local in sight? This happens to me all the time, because I’m terrible at planning things out. Since the dawn of twitter, things have got a little bit better, and I’ve used the Hive Mind to pin down quite a few good places in new cities at the very last second, having failed to do the whole boring planning thing beforehand, but that’s an unreliable method, if sometimes devastatingly effective. I need to get better at that whole boring planning thing. Books like this help, and this particular one hits right at one of my biggest blind spots: London. Now, I know that London is a big place, and I know that restaurants come and go with an alarming regularity, that there’s always some new fashion or other just around the corner, but you’ve got to start somewhere, and a little bit of knowledge goes a long way. 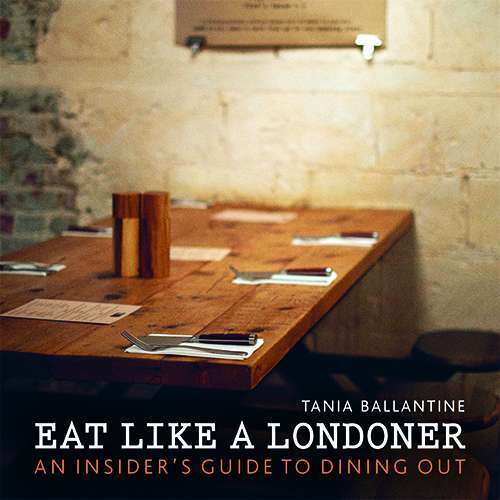 Tania Ballantine’s Eat Like a Londoner: An Insider’s Guide to Dining Out is a very good place to start. This generous pocket-sized book is a run-down of about a hundred restaurants dotted around the capital of various shapes, sizes and styles. Restaurants are arranged in terms of categories, with chapters covering cult classics. late nights, ‘small & buzzy’, and so on. There are other lists that further segment places by geographical area, places that are more forgiving for the last-minute diner, and vegetarian-friendly destinations. Well written, well presented, with lovely pictures of some frankly stunning food and dining rooms, this is a book written by somebody who obviously knows what she’s talking about, and I’d be happy to take her lead. I must plan better next time I’m in that London.